Mirror of Famous Generals of Japan - Yoshitoshi designed this fantastic series of fifty-one prints of military heroes from 1876 to 1882. These dramatic images of famous warriors created a sensation with the Japanese public. Full of violence and intense emotions, Yoshitoshi's bold and innovative compositions tackled a historic subject using a modern style. His realism and drafting skill captured the important legacy of these national heroes at a time when Japan was struggling with the aftermath of the Satsuma Rebellion. Classic Yoshitoshi images, these dynamic prints are a great choice for collectors. 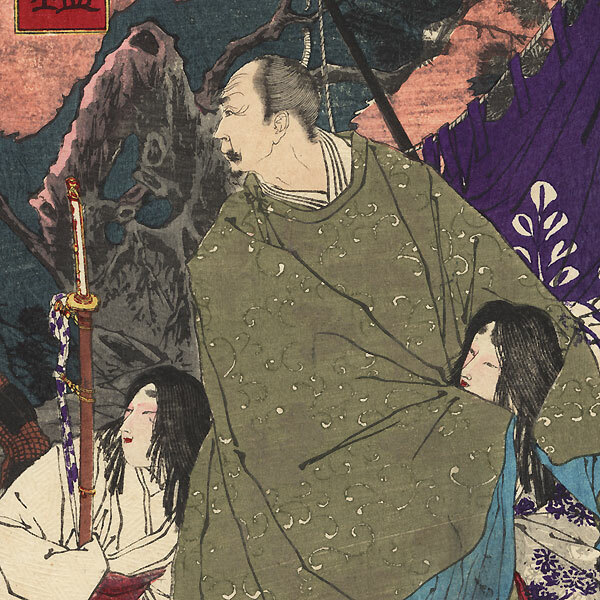 Toyotomi Hideyoshi and Kato Kiyomasa, 1876 - Intriguing image of the famous 16th century leader Toyotomi Hideyoshi shielding his mother , Omandokoro, from the warrior Kato Kiyomasa at an encampment in the countryside. 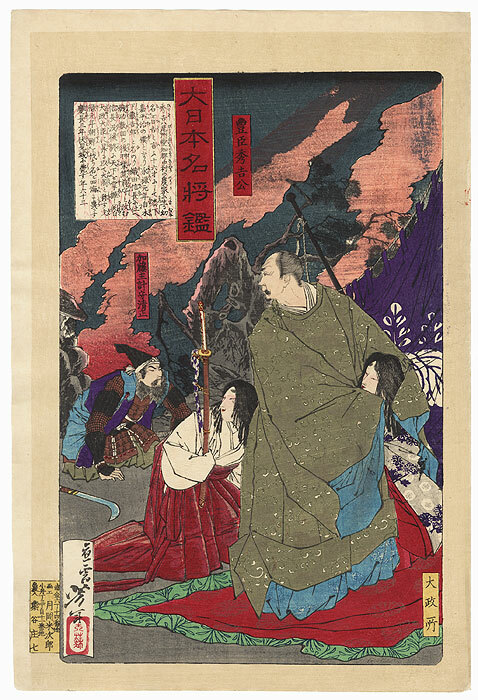 Hideyoshi wraps his arms about his mother as he looks back over his shoulder at Kiyomasa, who kneels on the ground at left, dressed in armor with a naginata on the ground beside him. Clouds of smoke billow in the background against the dark night sky. Includes a burnished geometric pattern on the white kimono of the sword bearer. 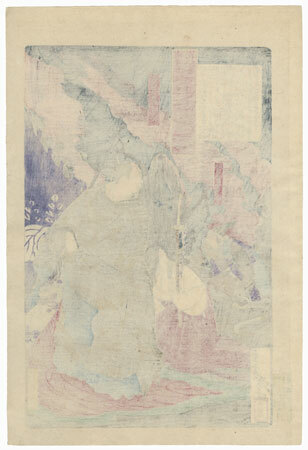 Fine delicate detail and expressive faces in this wonderful print.